There’s so much about gluten-free these days – it’s an industry in itself and marketing ‘Gluten-Free’ is seen in menus and food packaging. We hear of sports celebrities performing better after cutting gluten and we hear of celebrity moms choosing gluten-free diets for their children. But what is gluten and what happens when you eat it? As the 4th part of this series, today’s post explores the different types of gluten sensitivities. 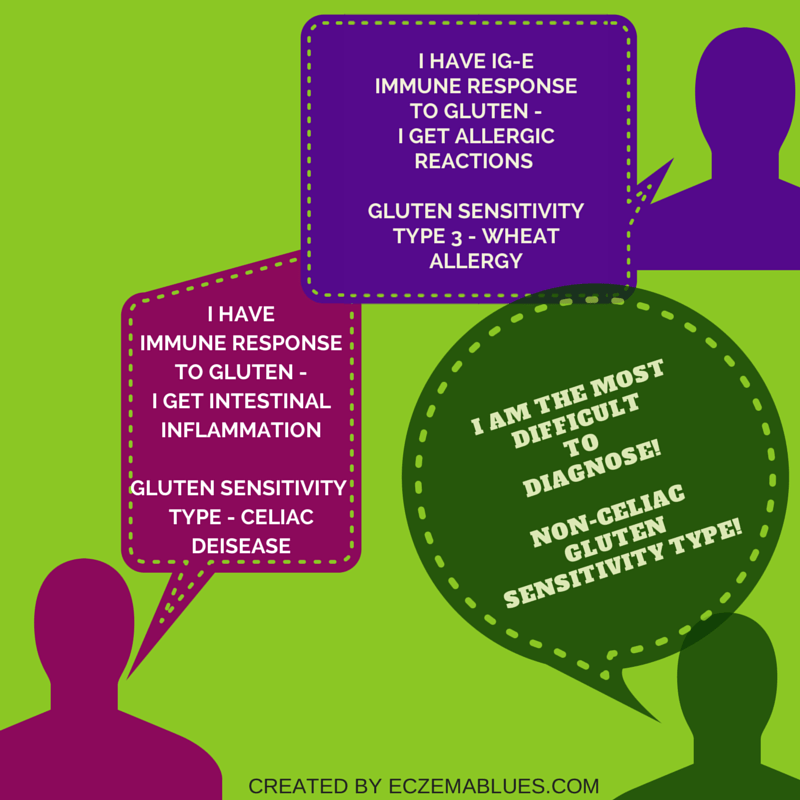 TOP 5 Facts You Need to Know to Differentiate Your “Gluten Sensitivity Type”! Gluten refers to the proteins found in wheat, barley, rye and triticale (a cross between wheat and rye). Gluten gives elasticity/stickiness to the dough. CD Fact #1: Involves immune system, BUT not IgE-mediated reaction to the gluten. CD Fact #2: Immune system attacks the villi in the esophagus when exposed to gluten protein gliadin, found in wheat, barley, rye, and sometimes oats. This lead to intestinal inflammation, flattening of the villi and long-term damage to the small intestine. Associated with high intestinal permeability whereby bacteria, antigens and undigested food ‘leaked’ through the gastrointestinal barrier. CD Fact #3: Symptoms include diarrhea, abdominal bloating/pain/cramps, bone/joint pain, bruises, constipation, depression, failure to thrive for children, mouth sores, infertility/miscarriage, malnutrition, weight loss, chronic fatigue, anemia, blood or fats in stool, nausea, joint pain, tingling on hands/feet, Dermatitis Herpetiformis or no symptom. Related to malabsorption of nutrients due to the intestinal villi being compromised. CD Fact #4: Diagnosis is straightforward with tests to detect AGA (Antigliadin) and EmA (Andomysium Antibodies). Cutting gluten before testing will affect results. Small intestinal biopsy is an accurate test for celiac disease. CD Fact #5: Treatment is strict avoidance of gluten in order for the villi to heal. Note that oats can be tainted with gluten and some common medications, vitamin supplements and cosmetic products also contain gluten. Untreated gluten has been linked to intestinal cancer, liver disease, small bowel ulcers and other inflammation-related diseases of the digestive tract, heart, joint and even brain. NCGS Fact #1: Does not involve immune system and is not celiac disease. However, patients clearly experience discomfort and symptoms after ingesting gluten. NCGS Fact #2: No intestinal inflammation and not associated with high intestinal permeability, unlike celiac disease. NCGS Fact #3: Symptoms are gastrointestinal symptoms like abdominal bloating, diarrhea, gas, cramps, headaches and fatigue. NCGS Fact #4: Diagnosis is not straightforward with no proven medical test. It is typically diagnosed after elimination of other similar conditions (for instance, wheat allergy, Irritable Bowel Syndrome) and after observation and further consultations. NCGS Fact #5: Treatment is avoidance of gluten ONLY after confirmation of this course of action by doctors. Doctors will eliminate the possibility of celiac disease, wheat allergy or other diseases before advising on treatment for NCGS. WA Fact #2: The increase in IgE antibodies trigger chemical release that lead to allergic reactions, that can either be manifested via the skin, respiratory or gastrointestinal systems and other behavioral issues. WA Fact #3: Wheat is one of the common food allergens in children and symptoms include eczema, rhinitis, asthma, urticaria, conjunctivitis, abdominal pain, diarrhea and angiodema. These symptoms could be immediate (swelling or hives) or be delayed, including low weight gain in children. There’s also exercise-induced anaphylaxis to wheat. WA Fact #4 Diagnosis is via allergy testing. WA Fact #5: Treatment is avoidance of wheat. There is no need to avoid barley and rye which contains gluten but not wheat. There is recently studied that people with non-celia gluten sensitivity may actually not be sensitive to gluten, but instead to FODMAPs. FODMAPs stand for fermentable oligo-, di-, and mono-saccharides and polyols, which are sugars, carbohydrates that tend to be poorly digested, e.g. frutose. It could be that gluten-containing grains are high in FODMAPs and thus avoiding gluten makes one who is sensitive to FODMAPs feel better. (see this study conducted as double-blind cross-over trial). Hope this 4-part series clarify! it did for me and I have a clearer picture and better appreciation of the complexities involved in understanding and diagnosing one’s gluten-related (or suspected!) condition.